Pelargonium quercifolium (sounds like a Harry Potter spell, doesn’t it?) 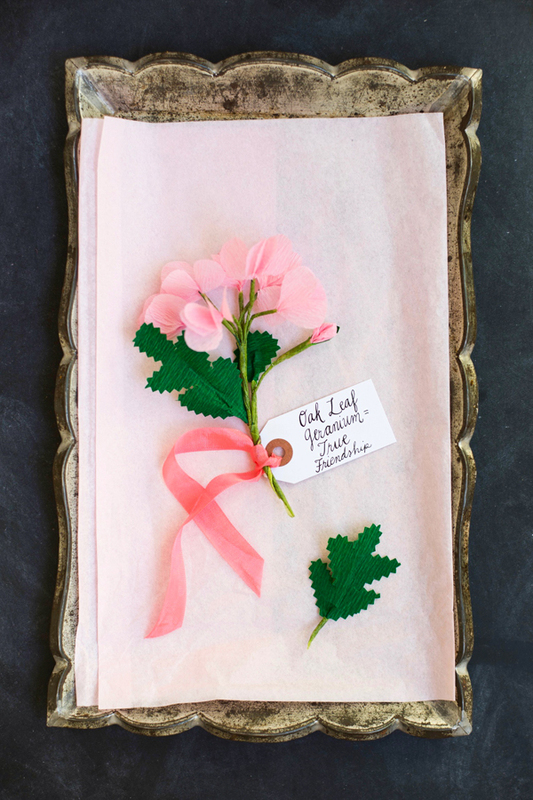 is a species of geranium known by the common name of oak leaf geranium – and the symbolic meaning of the flower is “true friendship.” Give your bestie a lovely handmade one that he or she will cherish forever, BFF style. 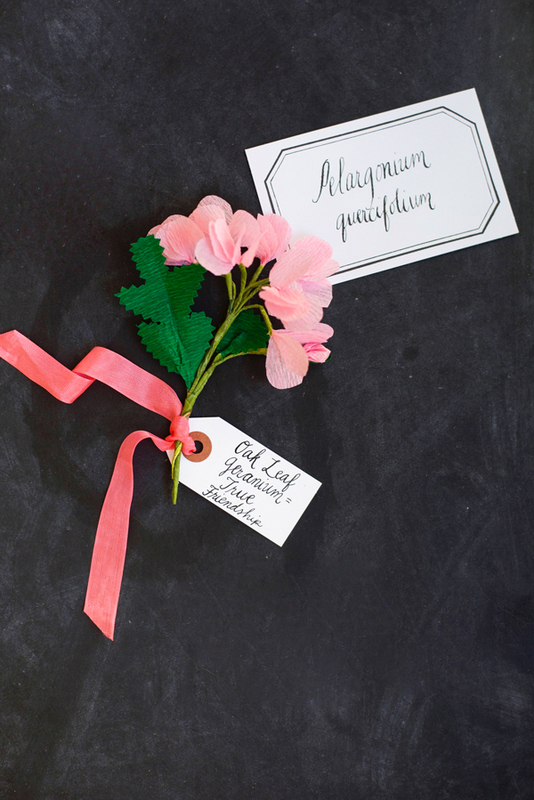 Materials needed: pink streamer or crepe paper, green crepe paper, green floral tape, scissors, wire, tag, ribbon, pen, pinking shears. 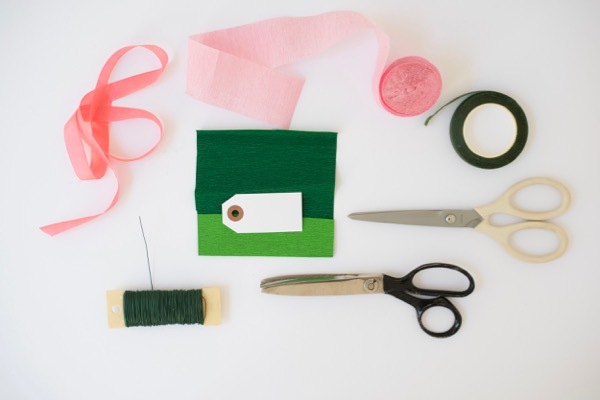 Step 1: Cut a 5” x 2” piece of streamer (or crepe paper) and fold into fifths. Step 2: Cut out a balloon shaped petal from the stack. Step 3: Gently twist the stem of the petals, and gently fan out the petals. Step 4: Rip off a 3 inch piece of floral tape, and wrap it a few times around the stems. Add a 3 inch piece of wire next to the stem and continue wrapping with floral tape to the bottom of the wire. Step 5: Repeat steps 1 – 4 four times, til you have a total of 5 separate bunches. Step 6: Crumple a small piece of crepe paper to create a tiny bud. Wrap green floral tape around the paper, attach a 3 inch piece of wire, and continue wrapping to the bottom of the wire. 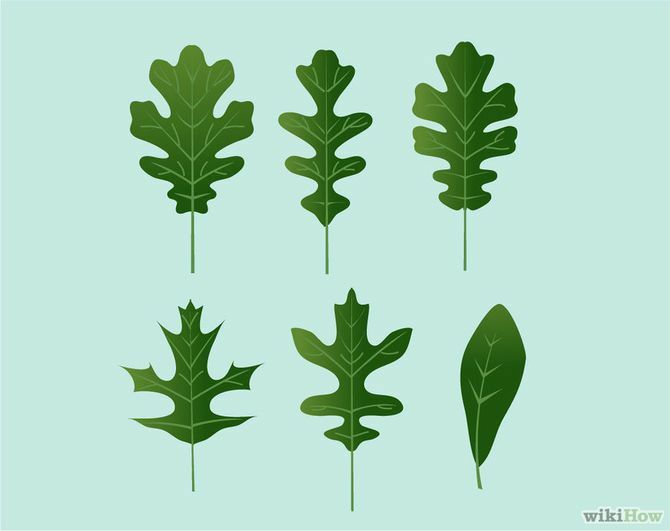 Step 7: From a 2 ½” x 2” piece of green crepe paper, use pinking shears to cut out a stylized leaf shape – I used this source for inspiration. Step 8: Rip off a 3 inch piece of floral tape, and wrap it a few times around the base of the leaf. 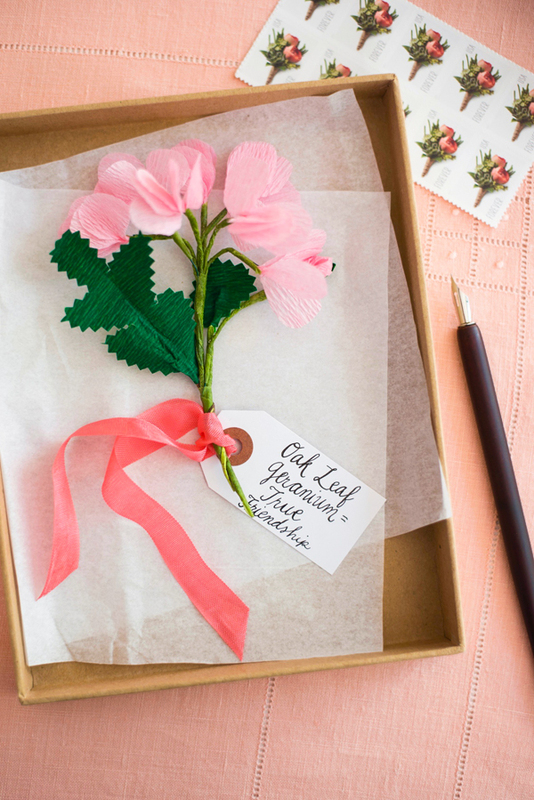 Add a 3 inch piece of wire next to the leaf and continue wrapping with floral tape to the bottom of the wire. Step 9: Repeat the above step with a smaller piece of green crepe paper to create a smaller leaf. 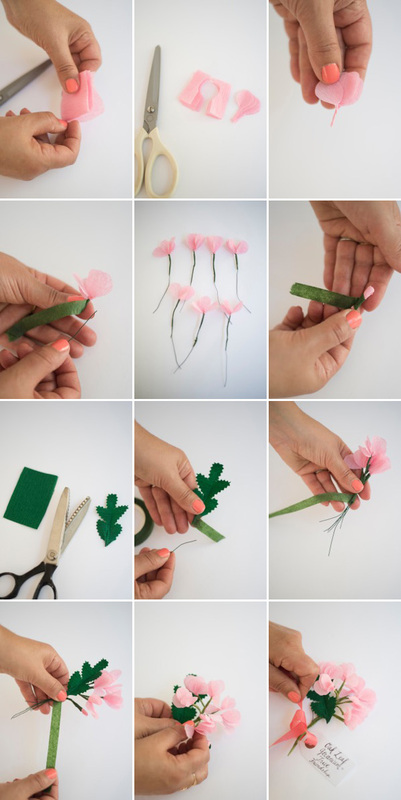 Step 10: Gather the five blossoms and tape them together with green floral tape. Then, gather the blossoms, one bud, and two leaves and arrange them loosely in your hand. Step 11: Wrap all the wires with with green floral to secure them together. After they are taped, adjust the wires to spread out the leaves and blossoms. 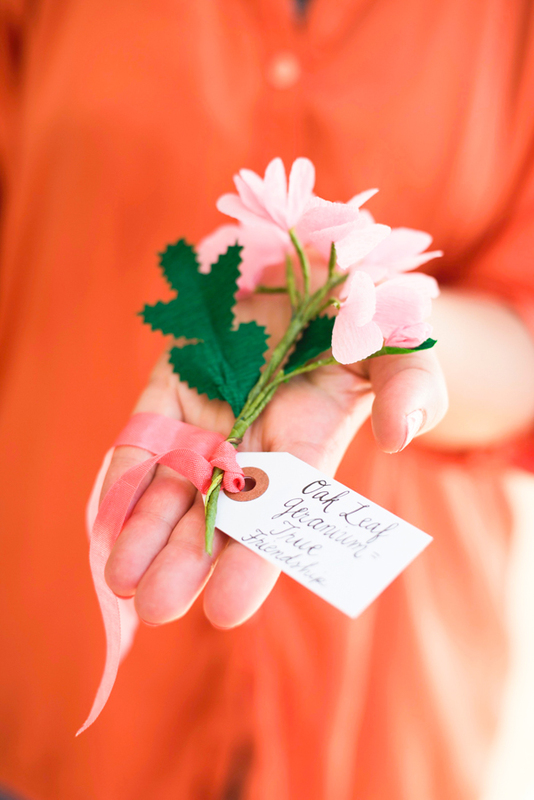 Step 12: Attach a tag that says “Oak Leaf Geranium = True Friendship” with a piece of ribbon to the stem. 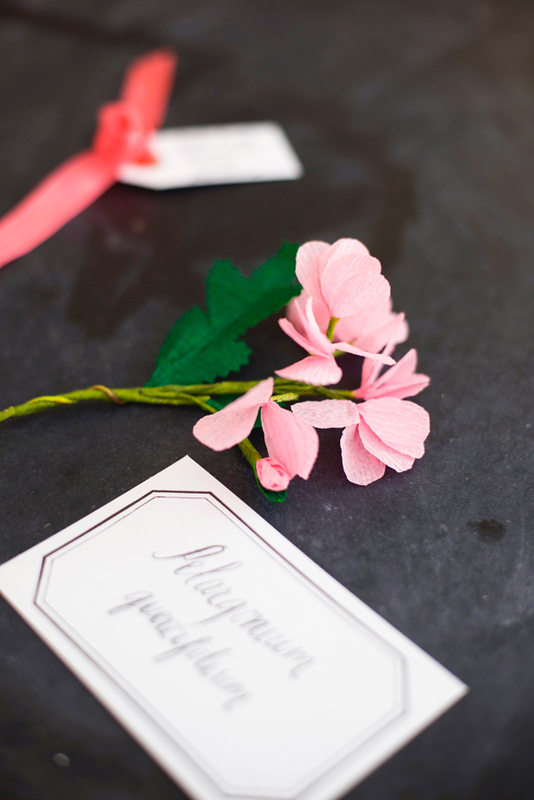 I love the sweetness of this DIY, so lovely! Thank you. This project has inspired me to start creating with paper. I love the pink you used for the petals, contrasted with the sharp, green leaves. So beautiful and delicate looking. These would be beautiful travel settings for a bridal or baby shower. So pretty!